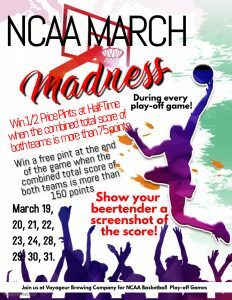 In addition to our music on Fridays from 4-7pm and our tours on Saturdays we have a few other things going on this month. 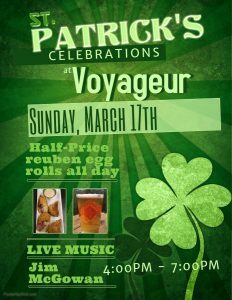 We’ll celebrate St. Patrick’s Day with Irish music by Jim McGowan and half-priced Reuben Egg Rolls. 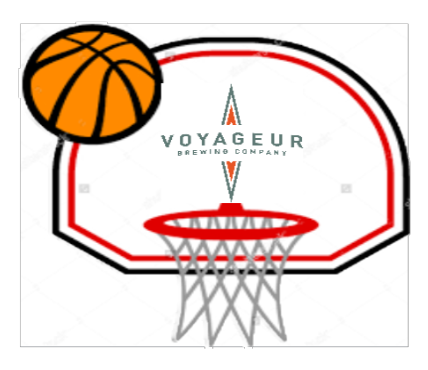 You’ll want Voyageur Brewing Company to be your March Madness viewing headquarters for the chance to win free beer during the games. 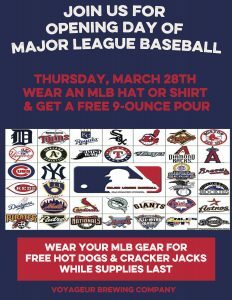 Major League Baseball opener is earlier than ever this year but we’ll be ready with free hot dogs and cracker jacks for folks who wear MLB Gear. Be sure to check out our Facebook Page or our website event calendar if you ever want to know what is happening at Voyageur.